Pin it! An easy, delicious perfect summer salad recipe. This is a really easy to make salad that's sure to satisfy even the most picky eater. 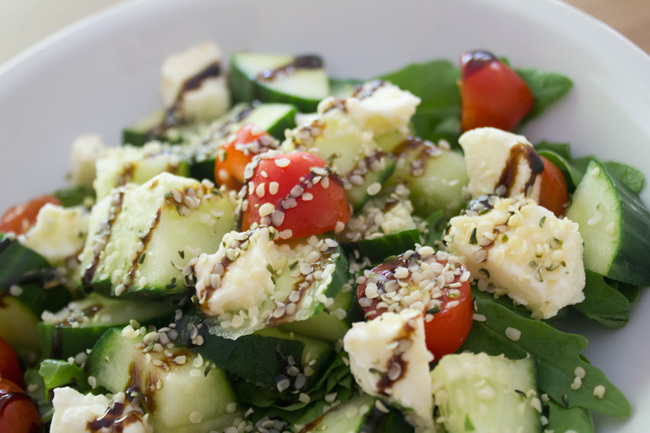 The cucumber and hemp seeds provide an unexpected yet welcomed change to the already perfect caprese, and the arugula amps up the vitamin and minerals factor so you can feel really good about what you're putting in your body. Perfect in the summer, this makes a great light lunch. In a large bowl, mix the cucumber, mozzarella, basil and tomatoes with salt and pepper and olive oil. On a plate, place a bed of arugula and add the cucumber mix on top. Sprinkle hemp hearts on top and drizzle with balsamic cream. Eat and enjoy.